Oh god. Just look at them. The tiny little eyes of tiny chibi-Christian Bale. If this guy asked you to swear to him, you’d be crossing a very fine line between laughing in his face and wanting to soil yourself because oh god the eyes. 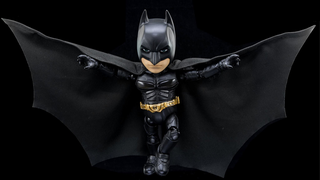 Herocross’ latest chibi figure features the Christian Bale Batman circa The Dark Knight Rises, coming in at 5.5” tall, in line with their other figures (yes, that means you can put Batman next to a Predator). Batman, befitting his reputation as a man with many wonderful toys, comes with a ton of cool accessories too. He has a Batarang, grapnel gun and The Dark Knight’s EMP gun, an alternate mask replicating the white-eyed “Bat Sonar” (that also conveniently gets rid of the creepy eye problem! ), and a fully functioning Bat-Signal light too. But seriously. We need to talk about the eyes. I’ve only just realised that Herocross’ past figures have avoided this mainly by going with characters without humanoid eyes, and it seems like for good reason—because they look absolutely terrifyingly weird in this aesthetic. It just looks so strange, and I can’t tell if it’s in a good way or a bad one. Batman will be available for preorder later this year, and he’ll set you back $115. You better buy one, otherwise he’ll keep staring into your soul until you hand over the cash.